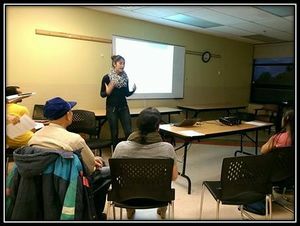 This Community-Based Experiential Learning (CBEL) project aimed to work alongside the South Vancouver Neighbourhood House (SVNH), a volunteer driven community and social services agency in South Vancouver. The project sought to renovate the currently underutilized rooftop gardens, by providing relevant and accurate information on gardening techniques and attempted to increase awareness and interest towards the project within the community. The questions addressed included what could be done to effectively improve the rooftop garden in order to make it useful to the SVNH community as well as how its improvement would impact food security amongst members. The main research method of this CBEL is based on qualitative research. In order to answer what the project intended to, a focus group was conducted with our community partner and members of SVNH to assess the needs within the garden, and the availability and interest of those engaging with the project; online resources were used to gather information about gardening techniques and ideas. The research conducted lead to the creation of a gardening plan to be delivered to the community. It was recommended that volunteers be informed of planting calendars and gardening methods for specific crops, and stimulate the usage of both the space and tools already available, so members become aware of outcomes that would be made possible with their participation. The project was constrained by limited participation of community members on the focus group as well as by the limited time availability of group members from LFS 350 and community partner. It is predicted that the project will generate an interest and an information platform for the community’s volunteers to recognize the benefits, both personal and for the community, of taking part in rooftop gardening at SVNH. In the course of LFS 350, students were assigned in groups to work in community-based experiential learning (CBEL) projects. These community projects provided the opportunity for the students to experience, learn and work on the food/agriculture issues that were existing in the partner communities in British Columbia. Our group, Group 23, is composed of eight students who are in different fields of study related to food. For Group 23, the project assigned was to assist South Vancouver Neighbourhood House (SVNH) in revitalizing its currently underutilized rooftop garden. In this project, we worked closely with Tanya Findlater and Michelle Lui from SVNH, and Nicolas Talloni from LFS 350 Teaching Team, whose inputs and feedback were very valuable to the project. SVNH is a volunteer-driven, community service agency with a goal to empower its residents in improving their quality of life and to strengthen the community through different projects and services (South Vancouver Neighbourhood House, 2009). Its facilities include a rooftop garden, which is currently maintained by staff and members from different programs. SVNH hopes to improve the utility and maintenance of this garden with the help of Group 23. See systems model for a more detailed look at the systems model of SVNH. In context with our community partner’s goal, our project’s main research question was: What can be done to effectively improve the rooftop garden to make it functional for the use of SVNH community? Based on the research question, Group 23’s focus in SVNH is to revitalize their underutilized rooftop garden with the participation of their members. In the beginning of the data collection, we developed questions to hold a focus group with the members of SVNH. 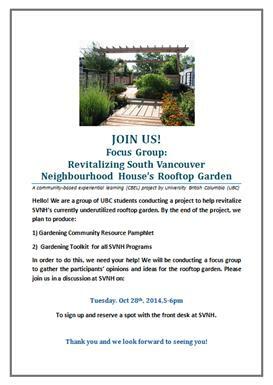 The goal of the focus group was to obtain preferences and opinions from the community members about SVNH’s rooftop garden. After the gathering of data, we conducted research on gardening and the development of gardening programs. We then compiled the information obtained to create a gardening plan tailored to SVNH. Through this plan, the community partner can teach and involve their volunteers and community members in gardening, with the underlying concept of food security as their end goal. By providing a plan for better usage of the gardens, the community members will have an easier access to nutritious and affordable foods. They will also learn the knowledge of growing and maintaining of the gardens, which they can potentially bring home to start a garden by themselves. The food system issue of concern for this project was food security. Group 23 used the rooftop garden as a “stepping stone” for the topic of food security to be made noticed within the community. As said by McCullum et al. (2005), the first stage of community food security focuses on strategies and activities that create small changes to existing food systems. By creating a garden plan to help SVNH to improve the conditions of the rooftop garden, we have taken the first step towards achieving community food security. The research method we adopted for this CBEL project was qualitative research. As described by Creswell (2003), the “qualitative approach is one in which the inquirer often makes knowledge claims based primarily on constructivist perspectives...researcher collects open-ended, emerging data with the primary intent of developing themes from the data”. Our research can be broken down to two parts, involving primary and secondary research. 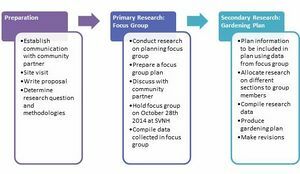 Part one of our research was a focus group (primary research) aimed to gain insights and ideas from members at SVNH, and part two followed using the information gather from the focus group to create a gardening plan. The information found in the gardening plan was obtained by gathering information from various existing research and other relevant sources (secondary research). Figure 1 provides a brief illustration of the process of our research. All communications between the group and our community partner were assigned to one group member for efficiency and consistency. Communications were done through emails, phone calls and two site visits. A focus group is a type of qualitative research in which a group of people are gathered together and are asked about their opinions, interests, and needs towards the interest of the researcher (Krueger, 2009). In our research, we were interested to find out the needs and preferences of the SVNH members who would potentially be involved in the utility of the SVNH rooftop garden. More specifically, we hoped to find out what they want to grow, their expectations of a gardening program and also to access their interest in a gardening program. Consent forms were given out prior to the focus group to seek consent from the participants to allow us to use the information they provided and multimedia during the session. Due to limitations of Group 23’s availability and the limited rooms available to use, we could only conduct one focus group. As the nature of the research directed us towards non-peer reviewed, practical-based sources rather than more reliable peer reviewed ones in conventional research, we relied more on sources from established and reliable groups, such as West Coast Seeds’ website, and performed cross-referencing if required. In addition, this research process was done with alignment to the goal of tailoring the information to SVNH’s rooftop garden, i.e. 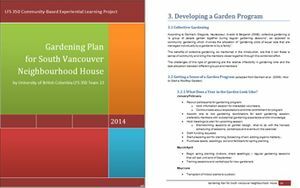 information found in the gardening plan to be relevant to rooftop gardening, Vancouver’s climate and the capacity of SVNH. In other words, the gardening plan was ensured to be feasible and relevant to the needs of SVNH. The gardening plan was repeatedly reviewed by the community partners and revised according to their feedback. A total of four revisions were made. See Appendix C for Gardening Plan. We had to revise our original proposal plan for our project due to time limitations. First, we planned to seek gardening experts or professionals’ advice for the plan but were unable to due to time limitation. Also a pamphlet was initially planned to be produced and distributed to SVNH members, to provide them with basic gardening information. However, due to time limitation, our community partner and the group agreed to remove this from the project. Four participants from various age groups attended our focus group meeting, and thus the approach had to be changed on the spot. The focus group’s main objective was to gather information from the participants based on their experiences in order to generate more useful and compelling knowledge than secondary research would be able to provide in order to use it as a guideline for the development of a gardening plan. One SVNH staff requested for a template of a gardening program plan, i.e. how to start a gardening program. Relating these findings back to our research question of “What can be done to effectively improve the rooftop garden to make it functional for the use of SVNH community?“, this focus group provided us with insights to the needs and expectations of the SVNH community towards the revitalization of the rooftop garden. However, it should be noted that the data collected might not be generalizable to the entire SVNH community due to the small sample size and limited demographic. The implementation of the rooftop garden plan in cooperation with SVNH has provided significant insights in many aspects in terms of food security. The main purpose of the gardening plan is to provide assistance in the revitalization of the existing garden in SVNH, and a focus group has been conducted to gain more profound understanding about the needs and demands of the SVNH community. The participants in the focus group shared different gardening experience and they looked forward to seeing a change in the rooftop garden through the plan. A preference of planting plants or vegetables, such as garlic, beans, and herbs, that require less care and watering interval has been discussed. According to the data we have collected, our research focus and questions can be further provided with solutions. What can be done to effectively improve the rooftop garden to make it functional for the use of SVNH community? Garden maintenance with proper techniques and suitable tools are lengthy but an inevitable process for a sustainably operating garden. Many practical and useful tools are recommended for advancing the gardening experience; for instance, spade is common for digging and rake is crucial for soil leveling (BBC, 2014). As suggested by Nardozzi (2009), there are a wide range of commercial fertilizers, including organic and chemical fertilizers, available for the specific use in gardens. However, organic fertilizers are found to be more appropriate nutrients to be used in promoting the underutilized gardens in SVNH. The other action that are considered to be beneficial for the gardens in SVNH community is the raising awareness towards the existing issue of food insecurity. A food system is a complex structure which engages individuals, communities, and the populations, and thus, active participation of the community members is essential in achieving food security (McCullum, Desjardins, Kraak, Ladipo, & Costello, 2005). How will the improvement of the rooftop garden affect food security within the community? Two potential advantages are foreseeable from the rooftop garden plan introduced in SVNH. The neighbourhoods will be more accessible to local and organic produces, which can potentially improve the public and environmental health. In addition, the land use efficiency will be increased while the limited urban spaces are implemented with agricultural utilization. Urban agriculture is not only an implementation that benefits self-producing households, but to a broader scope, it allows fresh, healthy, and affordable food products more reachable by a larger number of urban consumers (World Bank, & Open Knowledge Repository, 2013). Nevertheless, there are some limitations incurred during our research process. Mills (2012) states out four furies that university students and their community partners are potentially facing while conducting the community work. The conflicting schedules of SVNH and LFS group 23 members is an example of one of the furies, which is the challenge of " Student Emphasis on Flexibility vs. Community Emphasis on Dependability" (Mills, 2012). In addition, the lack of knowledge on gardening we have as the project conductors dispersed the effectiveness of the rooftop garden plan. Another limitation observed is the passive participation and the lack of interest of the community members in SVNH. In spite of these obstacles, many connections exist within our findings from the focus group in SVNH. Food insecurity can be potentially alleviated by the improvement on the rooftop gardens. In particular, community members gain more access to local food products and gardening and food knowledge. The engagement of the community members in the rooftop garden plan in SVNH helps build the community bond. The practice of the rooftop gardens may bring the residents in the neighbourhood closer together. Lastly, the utilization of the rooftop gardens in SVNH not only prosper the neighbourhood, but also the other communities that may interact with SVNH in the future. A ripple effect of continuously passing the knowledge down to other food systems is further created. Partaking in the rooftop garden revitalization project would contribute to the alleviation of food security in the community. For it to do so, however, it is necessary that volunteers be informed of planting calendars and gardening methods appropriate for specific plants, which are available in the gardening plan compiled throughout our project. Creating events around the produce from the garden or holding information sessions could increase the member’s interest and thus ensure there is enough participation to make the project viable. Thus, we recommend that future projects focus on more face-to-face interactions with the members in order to begin the actual re-planting of the garden. When further carrying out the project, students could try to generate connections between SVNH and gardening experts for information and active participation. All in all, the continuation of improving SVNH’s rooftop garden would potentially help SVNH achieve community food security. We believe that food security will not be achieved overnight; however, if everyone is willing to take one step forward in improving the rooftop garden, eventually the desired results will be achieved. We hope to see over time, SVNH’s rooftop garden can be a place to provide food to the community. Krueger, R. A. (2009). 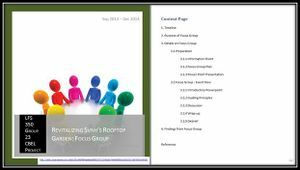 Focus groups: A practical guide for applied research. Sage. Mills, S. D. (2012). The Four Furies: Primary Tensions between Service-Learners and Host Agencies. Michigan Journal of Community Service Learning, 19(1), 33–43. Nardozzi, C. (2009). Choosing a Fertilizer for Your Vegetable Garden. In Vegetable Gardening for Dummies (2nd ed.). New York, NY: John Wiley & Sons, Inc.
World Bank, & Open Knowledge Repository. (2013). Urban agriculture: Findings from four city case studies. Washington, DC. This page was last edited on 30 November 2015, at 20:05.